Wayanad's mountainous terrain is home to a lot of wildlife, tribals and coffee plantations. Cardamom and Vanilla are also grown here. It borders both Karnataka and Tamilnadu, and the Wayanad Wildlife Sanctuary is in proximity with the protected areas of Bandipur in Karnataka and Mudumalai in Tamilnadu. The sanctuary is part of the Nilgiri Biosphere Reserve. Chembra Peak is the highest peak in Wayanad and is a great place for a trek. Trekking up this mountain takes almost a whole day, and you could set up camp up there for the night. Camping equipment can be hired from the District Tourism Promotion Council office. 25 kilometres from Kalpetta, in the Ambukuthy mountain, is where you would find the Edakkal cave. To being with, it is not a cave, but a fissure made by a corner of rock splitting off from the main body. Stone carvings that date back 5000 to 6000 years can be found on the rock walls, which represent human and animal figures and objects of human use and symbols. These carvings are proof that human civilization and/or settlement happened here during pre-historic times. The Kuruva island is an uninhabited island that makes for a great picnic spot. Almost a thousand acres of greenery home to rare species of birds, orchids and herbs give you a sense of being lost in a very special kind of wild. Lakkidi, in addition to being one of the more elevated places in Wayanad, also receives the highest amount of rainfall in India every year. Lakkidi is a picturesque spot, with mountain peaks, streams, never-ending greenery and winding roads all adding to its serenity. The sanctuary covers about 345 sq.kms of wild forest. 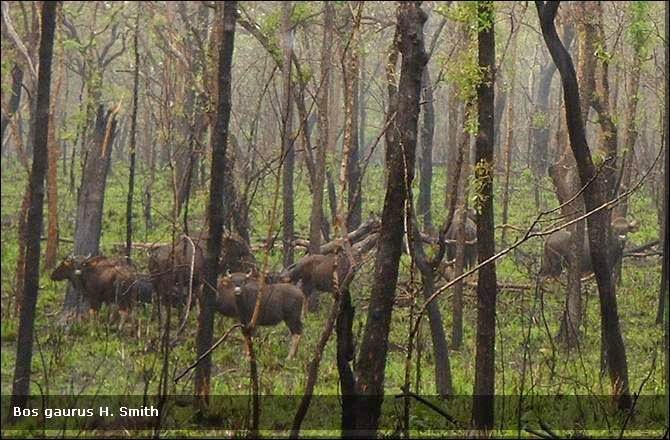 Elephant, spotted deer, bison, tiger, cheeta, wild bear, etc. are found in this sanctuary. The forest Department has facilities for providing elephant rides to tourists here. Pakshipathalam literally means “Birds’ Hell”. To get here, one must travel seventeen kilometres through wild forest, before which special permission has to be obtained from the Forest Department. Once this is done, the District Tourism Promotion Council arranges vehicle, guides, camping equipments, etc., on hire. The tomb of Pazhassi Raja, the Lion of Kerala, who organised guerilla type warfare against British East India Company, was cremated here in 1805. It is a natural fresh water lake set amidst scenic forests that is ideal for boating. This is both a picnic spot and a trekking centre. Locally known as Soochipara (literally Needle Rock), the waterfall here is more than 200 m.in height, and it has a cliff face that is ideal for rock climbing. By Air The nearest airport from Kalpetta is at Kozhikode. By Rail Nearest rail heads are at Kannur and Kozhikode. By Road Kalpetta is well connected by road.